George Romney is closely identified with the Rambler. While he was the Rambler’s biggest advocate, like Zora Duntov and the Corvette, Romney joined Nash after work had already begun on what would become the compact Rambler. He accepted George Mason’s offer of a job at Nash instead of a better offer from Packard because he was impressed with the prototype that was then called the X-Car. George Romney was one of the most competent car executives ever. In the video we posted yesterday, Romney himself has the highest praise for Mason, the real father of the Rambler. Mason was interested in compact cars and he was also interested in good fuel economy, but mostly he was interested in distinguishing Nash from the Big 3. Mason thought a smaller car with interior dimensions big enough for a family, with good performance, would stand out in the market. Mason also used a novel strategy when Nash rolled out the first Ramblers in 1950. The car was launched with a relatively expensive convertible (though it was cheaper than the Big 3’s ragtops) model. That was followed by a station wagon, and eventually a sedan. Another novel idea of Mason’s was selling the Rambler as a well equipped car. Small and economical didn’t have to mean cheap. Fifty years before Honda started selling fully equipped cars, the Rambler’s standard equipment included: wide whitewall tires; electric clock; custom steering wheel, disc hupcaps, and upholstery; pushbutton radio; Weather-Eye heater/defroster; directional signals; foam seat cushions; and courtesy lights. The interior, designed by former Paris fashion designer Helene Rother, was described as stylish and modernistic with fairly expensive fabrics and coordinated colors. The instrument panel was similar to those in the larger Nashes. Small also didn’t mean slow. The Rambler’s unibody construction, what Nash called Airflyte construction, resulted in a lightweight 2,430 pounds and with the 72 HP six from those bigger Nashes, the Rambler was considered to have brisk acceleration for its day, comparing favorably to sports cars like the MG-TC. To eliminate the need to reinforce the convertible’s body, fixed side roof rails were retained, like today’s Fiat 500 Cabriolet. The roof rails also meant that doors didn’t sag and resulted in a quieter ride. The commercial in the embedded video calls it a “rattleproof convertible”. This particular Rambler Custom convertible is part of the Driving America display at the Henry Ford Museum. Mason didn’t just load up the Rambler with equipment and launch with more expensive “fringe models” as he called them because he didn’t want the car perceived as cheap. Nash had limited capacity for the Rambler’s first model year and Mason wanted to limit demand. The Rambler seems to have acted as a halo vehicle for Nash. Though only 11,000 Ramblers were sold in the 1950 model year, it ended up being Nash’s best sales year to date as people flocked to dealerships to see the Rambler. In 1951, Nash brought a new factory online and was able to sell 70,000 Ramblers. Romney’s confidence in the prototype was well placed. 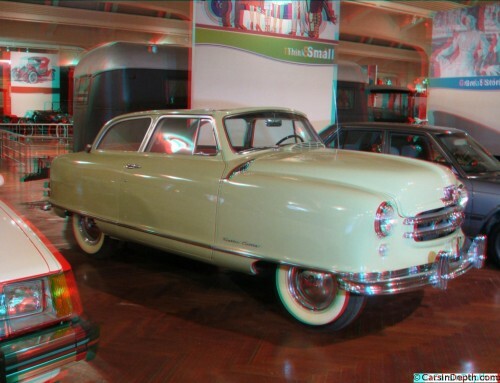 This entry was posted in 3D Imagery, 3D Photos, Nash and tagged 1950 Rambler Convertible, George Romney, George W. Mason, Nash, Nash Rambler. Bookmark the permalink.